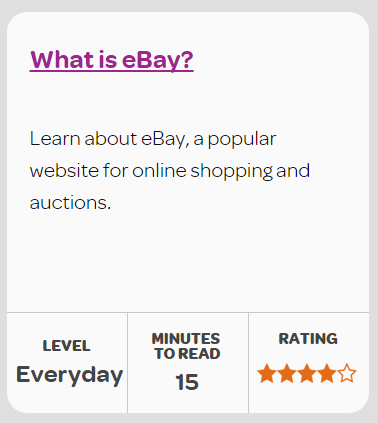 Learn about eBay, a popular website for online shopping and auctions. Follow these steps to help make your online application more successful. Get help to sign up for an account where you can buy and download apps for your device. Learn how to create a strong and memorable password. What are the common features of all devices? Learn how to use Skype to speak with people using video and voice calls over the internet. Register as an eBay seller, to get started selling your items online. Learn how to set up an email address with Gmail also known as ‘Google Mail’. Learn about LinkedIn, a professional social networking website. Learn how to find information online in languages other than English. Learn how to start selling your unwanted items online. you just want to explore. The 'Most Popular' learning guides are the guides that users of Go Digi have found the most helpful. You can add your vote too for the guides you find most helpful at the end of each guide. You can also click the 'load more' text at the bottom of the page which will take you to a new page. On this page, you can view the next page of results of the most popular Go Digi learning guides. Each guide featured in the learning guide area has 5 bits of information to help you choose which guide you would like to read more about.